The Madame Binh Graphics Collective (MBGC) was an anti-imperialist women’s poster, printmaking, and street art collective based in New York City between 1975 and 1983. 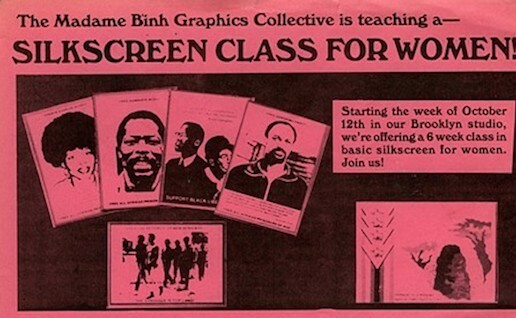 For a brief, intense period of time, the MBGC collaborated on projects against racism and in solidarity with national liberation movements, producing numerous multicolored silkscreened prints, note cards, banners, posters, fliers, and other print ephemera before withdrawing into the isolation of a sectarian and militaristic political line. By 1982 its core members were in prison or underground. Mary Patten is a visual artist, video-maker, writer, educator, occasional curator, and a long-time community and political activist. In 2012, she published Revolution as an Eternal Dream: the Exemplary Failure of the Madame Binh Graphics Collective, a book-length visual essay on the political practice and visual propaganda of the MBGC. A short but intense portrait of 1970s–1980s "new left" radical political activism in the U.S., the book explores the perpetual desire for revolution, as well as the frailty of such dreams. Stéphanie Jeanjean, adjunct assistant professor of art history in the Faculty of Humanities and Social Sciences and co-curator of the exhibition WE DISSENT… Design of the Women’s Movement in New York, joins Patten in a gallery talk about work by MBGC.